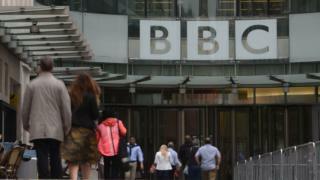 Men working for the BBC earn an average of 9.3% more than women, a report into the corporation's staff pay has found. The figure covers all staff, on and off air, and has been put down to the fact there are more men in senior jobs. It compares with a UK average of 18% and BBC director general Tony Hall said it showed the BBC was "in a better place than many organisations". It follows a row over star salaries, in which it was revealed that most of the top-earning presenters were men. Lord Hall has pledged to close the pay gap by 2020 and said the corporation should be "an exemplar of what can be achieved when it comes to pay, fairness, gender and representation". The gender pay report has been published alongside an equal pay audit, which has been conducted by consultancy firm PwC and legal firm Eversheds, and was overseen by former Court of Appeal judge Sir Patrick Elias. Sir Patrick said the reason behind the 9.3% figure was "an under-representation of women in the more senior jobs". The report says 59% of staff in the lowest four grades are women, while 59% of those in the top two grades and among senior managers are men. But Sir Patrick said there was no evidence of "systemic discrimination against women" at the BBC. The audit "does not, and could not, categorically establish that there is no discrimination in relation to groups or individuals", however, he added. There were also a number of "failings" in procedures that need to be improved, the audit found. But Sir Patrick added: "These failings apply across the board, affecting both men and women alike." Gerry Morrissey, head of Bectu, a trade union which represents some of the BBC's workforce, said: "The BBC must not rest on its laurels in respect of the overall gender pay gap. "The report finds that the gap is much less than the national average but that should not obscure the fact that inequality is a factor for some staff day in and day out." Michelle Stanistreet, general secretary of the National Union of Journalists, said there was "a problem of unequal pay". She said she was aware of "a significant amount of cases" where women say they're being paid less for doing the same or similar work. A separate review into the BBC's arrangements with on-air presenters, editors and correspondents will be finished by the end of the year. Chris Evans was top of the list on £2.2m, followed by six more men. Strictly Come Dancing's Claudia Winkleman was the best-paid female presenter - joint eighth overall - earning between £450,000 and £500,000. Last month, female presenters demanded "real change" before the end of the year. The government has ordered all charities, private and public sector employers with 250 or more employees to publish their gender pay details by April 2018. The BBC's report also looked at pay gaps in other areas. The disability pay gap is 3.3%, it found, while the gap affecting black, Asian and minority ethnic (BAME) staff is 0.4%.